Apple, Lebanese, Salad Bush or Burpless  whatever your choice, now's the time for growing cucumbers. November's a great month for sowing cucumbers. At this time of year the soil is warm enough for the seeds to germinate with no trouble, and cucumber plants just love growing through the hot months of December, January and February. Cucumber seeds, like the related pumpkins, zucchinis and squashes, should be sown into well-drained mounds of soil that's been enriched with some well-rotted compost, Nature's Way Organic Sheep Pellets or Blood and Bone, and half a handful of Gro-Plus Complete. This way they'll have all the nutrients they'll need to grow and fruit successfully. Before planting, give acid soils (those in areas where azaleas flourish) a sprinkling of Yates Gro-Plus Garden Lime. Water the soil well the day before sowing and keep the soil evenly moist, but not too wet; cucumber seeds will rot if there's too much water in the soil. Sow up to half a dozen seeds into each mound and, after the seeds germinate, remove the weakest-looking plants, leaving the two or three strongest. As the plants grow, feed them every couple of weeks with Thrive, and change to high-potash Thrive Flower & Fruit when they show signs of flowering. Water the plants regularly at their bases, always keeping the leaves as dry as possible. Fungi need moist conditions to develop and, even though cucumbers are susceptible to fungal diseases, if the leaves stay dry it's far more difficult for disease to take hold. Downy mildew is one of the most common diseases that attacks cucumbers, especially during damp weather. If signs of this disease appear  leaves become blotched and yellow, with downy patches beneath  pick off affected leaves and spray with Yates Bravo fungicide. Cucumber plants have both male and female flowers, but only the female flowers will produce fruit. However, in order to do so, they must be pollinated by pollen from the male flower. This important transfer is usually conducted by bees, but the gardener can increase the quantity of fruit by carrying out some judicious hand pollination. The female flowers are easy to identify because each has a tiny cucumber at the base. Use a small brush to remove some of the pollen from the male flower and gently brush it onto the centre of the female flower. If cucumbers drop off the vine just after they start to develop, it's usually because they haven't been properly pollinated. Good growing conditions  watering and fertilising  will also improve the size and quality of a cucumber crop. Crystal Apple - traditional round favourite with crisp, creamy-skinned fruit. Lebanese - harvest when small and eat skin and all. 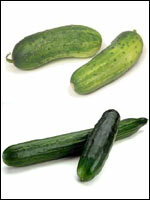 Long Green - large, long and fleshy with a smooth skin. Great for slicing. Gherkin Pickling - pick when 5-10cm long for pickling or salads. Salad Bush - compact, bushy plant for small gardens. Burpless - good flavour and easy to digest.